Posted by elizabethwong in Current Affairs, Democracy, Human Rights, Malaysia, Politics, Race Relations, Readings. In the past month, two massive rallies calling for political change were held in Kuala Lumpur. In any democracies, this would be quite normal but in Malaysia, rallies are the purview of the ruling National Front (BN), carefully staged to show support to the government or the ruling UMNO (United Malays National Organisation) party. The police often deny a permit for opposition parties to hold outdoor demonstrations or rallies. These two rallies were different; they were organised by NGOs, albeit with support from opposition parties. The first rally, on 10 November, was organised by BERSIH (Malay for clean), a coalition of NGOs and opposition parties calling for “clean” elections. Under the existing electoral system, through indirect control of the Electoral Commission, ethnic mobilisation, money politics, manipulation of the electoral roll, gerrymandering, postal votes, double voting, mass media control and others, the BN has won every election since independence. The standing joke in Malaysia is that BN wins the election before the first vote is cast, the only question is the margin of victory. BERSIH wants electoral reform in all the areas mentioned above. To the surprise of many, more than 40,000 BERSIH supporters in yellow t-shirts came out despite public warnings from the Prime Minister and the Police that the rally was illegal and those who take part will be arrested. The police attempted to lock-down downtown KL but failed. In some areas, the police used tear gas and water cannons laced with chemicals to clear the streets. Anwar Ibrahim, Lim Kit Siang and Hadi Haji Awang, leaders of the three main opposition parties – National Justice Party (PKR) , Democratic Action Party (DAP) and Parti Islam (PAS) respectively – managed to evade the police and lead thousands to hand over the BERSIH memorandum on electoral reform to a representative of the royal palace. Ramdas Tikamdas, former President of the National Human Rights Society (Hakam) wrote a short opinion piece this morning to protest the heavy-handed and draconian tactics to snuff out voices of the dispossessed. A minority ethnic community claiming to be victims of state policy of affirmative action for the ethnic majority with political patronage, files a class action, not in their own land where they allege the abuse and discrimination but in Great Britain, the colonial power which transported them there 150 years ago for indentured labour to lay the foundations of the infrastructure roads and railways and the plantation economy upon which the present trumpeted progress and development is based. But, they contend they have been alienated, sidelined and generally left to their own devises in their long houses, slums, squatter colonies and teaching houses that pass off as schools; and the small temples in these areas are not on their own land because poverty prevents private ownership. Why do they not seek redress in their own land? Because they have no confidence in the apparatus of the State which they contend has contaminated every institution which makes up a democracy, the police, the attorney general’s chambers, the civil service, even the courts. Posted by elizabethwong in Current Affairs, Democracy, Human Rights, International, Malaysia, Politics, Readings. Perhaps this is the perfect moment to introduce R. Sivarasa, one of most renown, committed and consistent human rights advocate in Malaysia. Siva was a key mover in the ISA Family Support Group during the turbulent time of the 1987 ISA arrests of social activists, politicians, activists, trade unionists etc. He, with ISA detainees who were later released from Kamunting, formed Suara Rakyat Malaysia (SUARAM), which grew to be Malaysia’s leading human rights organisation. Posted by elizabethwong in Malaysia, Note2Self, Politics, Readings. Both are graduates of Oxford, but what a difference between the two! What separates them is that elusive quality: class. One has it; the other does not. When you have class, Oxford will bring out the best in you. When you do not, not even esteemed Oxford can do much for you. One is a crown prince, a sultan-to-be whose recent wedding warmed the hearts of Malaysians for its elegant simplicity and regal restraint. His eloquent speeches inspire the young and old alike; they enthusiastically embrace his enlightened vision of Malaysia. He appeals to their idealism and decency, and they in turn respond in kind. His understated passion and cool rationality resonate with the citizens. He elevates the tone of our civil discourse. In short, Raja Nazrin is “Yang Teramat Mulia” (“The Most Esteemed”) personified. The other is a neophyte political operative, with grand pretensions of being the next Prime Minister. For now however, he is till struggling just to have the title (but not the qualities) of a “Yang Berhormat” (“The Honorable”) that goes with being a Member of Parliament. His obscenely ostentatious wedding a few years back dragged on for days, with multiple ceremonies. Its extravagance easily outmatched the wedding of Prince Charles and Princess Diana, minus of course the royal elegance. Today he is again indulging in excesses; this time hurling insults at Malaysians and assaulting their sense of decency. Posted by elizabethwong in Current Affairs, Democracy, Note2Self, Politics, Race Relations, Readings. 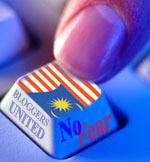 For those without access to Malaysiakini – an interesting poll which some of us looked at yesterday… and groaned. So, before you break out the champagne or light fireworks, please analyse the voting demographics of each constituency, esp. those who harbour Parliamentarian dreams. Also bear in mind, there are always BN-block votes in each constituency. Too much emphasis had been put on an earlier poll, which also also indicated the so-called ‘Chinese-swing” votes. This is exactly why the “Chinese”-component parties of BN have been asking for a later date for General Elections, but Umno has decided that setting aside their concerns will still give them the majority of seats in Parliament. Those with 70% or more of Chinese voters will do well, but not the rest. This also means that Opposition parties who hold these coveted seats will allocate them to their Chosen Ones. The rest will have to fight it out as hard as, if not harder, like during 2004. Opposition MPs-wanna-be’s have to do so much more work.